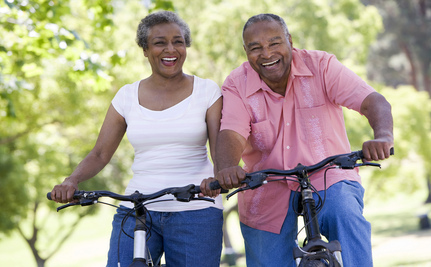 A new poll from Gallup reveals that older Americans are more emotionally healthy than their younger counterparts. Could this make getting old something to look forward to? Reading through the results, it seems that although aging has its downsides, people in their 70′s and 80′s reported significantly higher emotional health than younger Americans. Gallup acknowledged that its poll may not have reached people who are physically impaired and live in nursing homes, and may be more depressed or unhappy, but added that this omission is probably not enough to account for the gap between older and younger Americans. I guess we have to trust them on that one. A shockingly low percentage of Americans reports high emotional health, regardless of their age. Less than 1 in 3 Americans between the ages of 18 and 24 has good emotional health. Emotional health then drops from there, and remains mostly constant until people reach their 60′s, when the percentage skyrockets to 31%. The Americans with the highest emotional health are people between the age of 70 and 80, according to Gallup’s findings. Although it may seem strange that elderly people would have the highest emotional health, given the premium that our culture places on youth, these findings actually make sense. People begin to retire in their 60′s, and no longer have the stress and pressure of a career. They are also not trying to balance their work and family life, and their children are probably out of the house (or close to it). Chances are, if they’re married, their spouse is still alive, and their health is still fairly good. In many ways, 70 is a great age to be, especially if you have saved throughout your life. No wonder 70-year-olds are more likely to report “smiling/laughing, learning/doing something interesting, being treated with respect, enjoyment, happiness” in the past day. Photo from SCA Svenska Cellulosa Aktiebolaget via flickr. I cannot agree more with what this post has said. I am at 54, still working, but my pressure is weaning, my level of happiness is uprising, my son, still at home, but pretty well rounded, with a good job. My husband healthy, working for 20 years in the same place.. I have 4 animals that keep me going, and a 91 years old lady (my mother in law) who doesn't take any medication and walked without a cane until a few months ago. And yes, I look forward to the elderly years also and try my best to protect my health without the aid of doctors or medication. The health is in what we eat - I am vegetarian, I ride the bike to work everyday and I feel this new life style has a lot to do with my level of happiness and life balance. Once again, great post. It's very very true! I should explain that I am English and live in Somerset UK - at least I don't have to pay for my medical care. I haven't mentioned my recent knee replacement repair or that a fox killed 12 out of my 14 ducks. All problems I could do without! At least I am not bored - worried, depressed, yes. My heart goes out to you. Sounds like a hard time to put it mildly. Chickens (owned by my neighbors) make me happy too. Their sounds just make me giggle, so a laid egg or a sunrise is fun and funny. At 70 I'm happy much of the time. Writing a poem, reading a book, seeing a bird, bee, or butterfly make me happy. A blue jay's purr. Too adorable. My cat, when she lets me sleep, the same. When the plants grow and flowers bloom, I'm happy as if they were my children. The canyon a constantly changing bit of beauty dressed in colouds, or purple shadows, or new green growth...a Nature movie. When my kid is happy or grandkid, I could fly. My neighbors are wonderful, surrogate family. When my husband's body was being taken away, they circled me and held me while I cried...Retiring and spending days talking and laughing with him was glorious. I loved taking care of him as he was dying (except for the physical pain that caused me and his suffering), but the loving actions made me happy. Wisdom is a nice path to happiness and it comes with age. My friends and I are generally happier than the young people we know...at least on an enduring scale. There are not the highs and lows, but more of a general feeling of accomplishment and joy. We are fortunate to have decent health care, though, and are concerned about the lack of good health care for many of our fellow citizens. As a happy 68-year-old American I must agree.